The Lamy Wild Rubin (ruby) Studio pens have finally arrived! 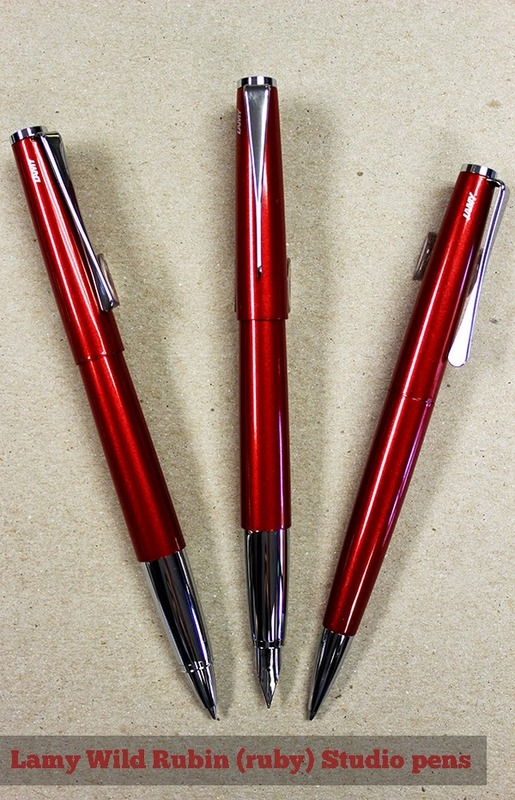 The pictures I first saw of the Wild Rubin reminded me of the Lamy Royal Red color. Boy, was I wrong. The true color of the Wild Rubin does not come through in the pictures. The Ruby color is shimmery and bright, not a matte color at all. The Wild Rubin has a stainless steel barrel and polished chrome accents. It has the iconic propeller clip. The fountain pen and rollerball are the same style as previous colors, but the ballpoint is now tapered and has a longer front section. The finish is smooth and lacquered, not the usual satin metal finish. The fountain pen is available with a stainless steel nib or a 14k nib, both pens come with a converter and ink cartridge to start writing right away. The 14k fountain pen arrives in a gift box with a bottle of blue ink. All in all - these are beautiful pens and a great addition to any pen lovers collection.